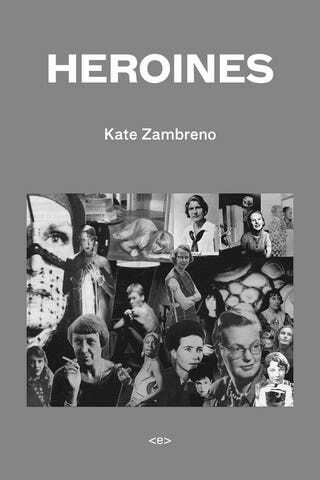 Books You Should Read: "Heroines"
Kate Zambreno's book Heroines comes out today! And you should read it. It is fantastic. It is basically How A Book Should Be. You should also read Kate Zambreno's blog. How good is Kate Zambreno's blog? I just typed her blog URL into the URL-making thingee of this idiotic CMS from memory, is how good - and you could list the personal blogs whose URLs I know and can type by heart on the fingers of a one-handed man who lost a couple in a knife fight down in Reno. I am beginning to realize that taking the self out of our essays is a form of repression. Taking the self out feels like obeying a gag order-pretending an objectivity where there is nothing objective about the experience of confronting and engaging with and swooning over literature. Heroines is a sort of hybrid memoir and literary scavenger hunt in search of what you might jokingly call the WAGs of Modernism - the women whose papers weren't archived, whose oral histories weren't recorded, whose lives aren't accorded any kind of public memory apart from their men. Even though they were writers in their own right. Olive Moore. Vivien(ne) Eliot. Zelda Fitzgerald. Anna Kavan. Jane Bowles. Although Zambreno's interest in the neglected women writers of the Modernist movement is longstanding, the book draws on blog posts she wrote while living in Ohio, where she had moved to follow her husband to a tenure-track job. That's an experience many coupled women have: you stack up the professional opportunities, you weigh the respective earnings, and you find that, no matter how the two of you do the math, he wins. And when you move to Akron or wherever he takes you, you start to question your own ambition, your own capabilities, the extent to which your identity is or should be subsumed into his. I think men are much more rarely in a position to ask those questions of themselves; they always seem to get offered the tenure track. It's no coincidence that Zambreno found her topic just as her own life was beginning to resemble her subjects'. The book is startlingly insightful. Zambreno writes of Zelda Fitzgerald and F. Scott Fitzgerald's relationship, "She played the parts so he could immortalize her." He draws almost verbatim from her diaries and letters-turning down an offer to publish her journals. They were his material he insisted. She was all raw and intense emotion. "I am not going to write you anymore. I am too unstable." In a mock-serious review of The Beautiful and the Damned, Zelda writes:"It seems to me that on one page I recognized a portion of an old diary of mine which mysteriously disappeared shortly after my marriage, and also scraps of letters which, though considerably edited, sound to me vaguely familiar. In fact, Mr. Fitzgerald-I believe that is how he spells his name-seems to believe that plagiarism begins at home." Yet of course the flapper or Surrealist femme-enfant is not a writer. She might write loveletters or keep a journal (whatever happened to Zelda's teen-dream diary?) but she is not a serious writer or taken seriously, even when she eventually longs for this. Even if she could write her own life better than he could. I didn't know whether all these notes I was hoarding were criticism or experimental biography or memoir or a novel. I started rereading novels during the long spaces of the day, the times in between teaching-Madame Bovary, Tropic of Cancer. Meditating on these male authors who I found so ecstatic to read but I also kind of hated, if that makes sense. I started a blog. I didn't know anyone who blogged. I think I was trying to notebook these ideas. I thought, Maybe what I'm doing is essaying. I was surprised to find this community out there, of writers with similar obsessions. I went from invisible community-the wives, my regular seance-to another invisible community-online. Sheila Heti told me she thinks of Heroines as a novel. Maybe it is a novel. I don't know. Anyway. Heroines. You should totally read it.